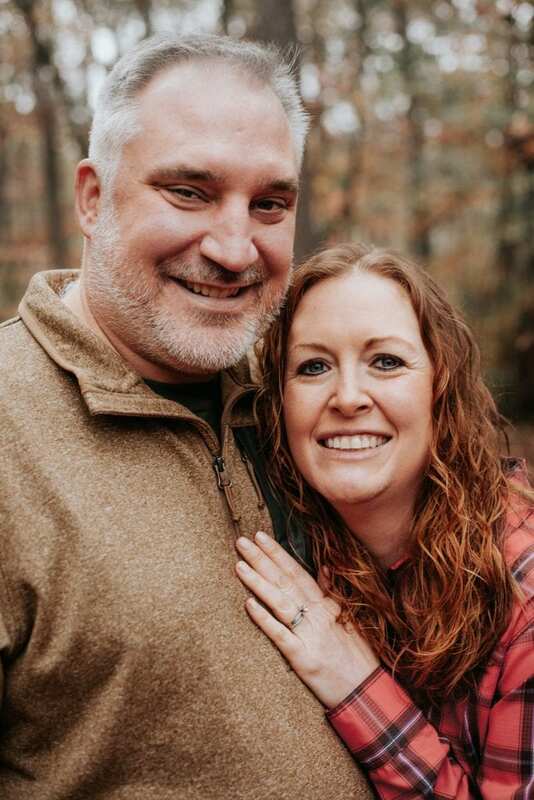 After recently spending weekends in both Memphis and Nashville, we were ready to slow down and get back to nature. For us, the best way to do that is to head to a national park. 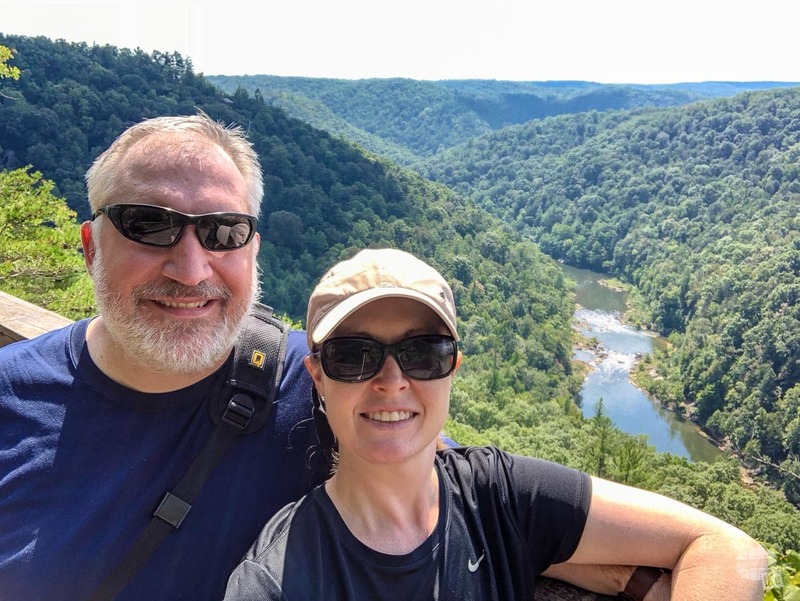 This time, we chose the two National Rivers of Eastern Tennessee: Big South Fork National River and Recreation Area and Obed Wild and Scenic River. Both rivers are both located about 2.5 hours northeast of Nashville and about an hour west of Interstate 75. Additionally, US Hwy 27 runs between the two parks, making a visit to both of them easy. 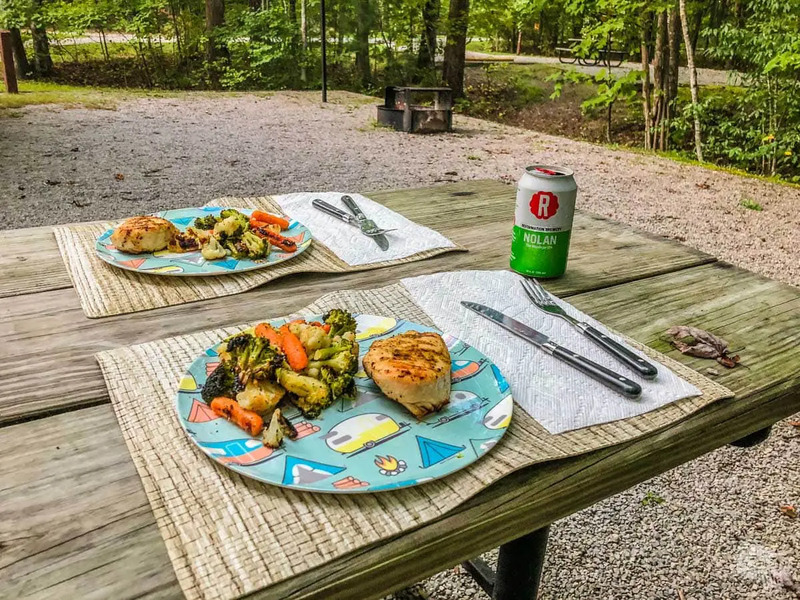 In fact, we camped at Big South Fork and easily made it to Obed as a day trip, getting back in plenty of time for dinner. As you might expect, both rivers offer rafting and other boating opportunities. What you might not expect is the number of other activities you can do at these parks, which include hiking, rock climbing, bouldering and horseback riding. A visit to either Obed WSR or Big South Fork NRRA will give you plenty of opportunities to get outside and be active. 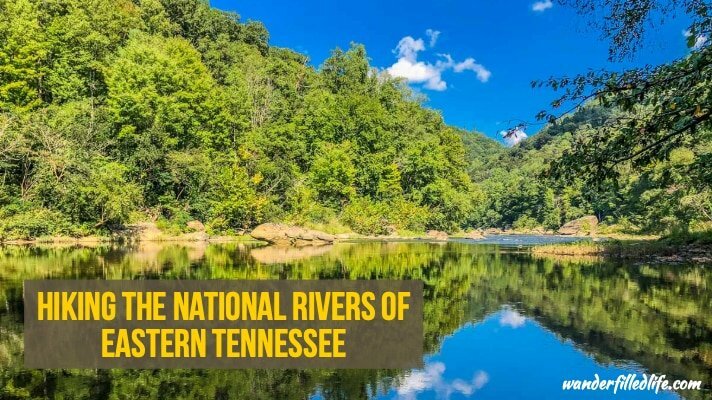 Established in 1974, the Big South Fork NRRA protects the Big South Fork of the Cumberland River and its tributaries in northern Tennessee and southern Kentucky. In addition to the river, there is an extensive selection of hiking trails and natural features. 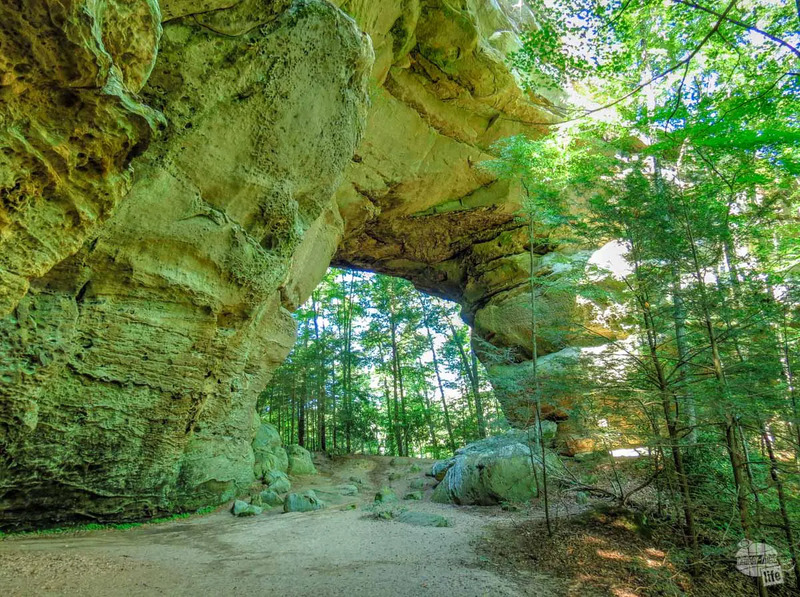 We were especially surprised to find that the park contains the highest concentration of natural bridges of any park in the eastern United States. The Bandy Creek Visitor Center, west of Oneida, TN, is a great place to start your visit to Big South Fork. Here, you can talk to a ranger, watch the park film and pick up a park map, newsletter and hiking guides. Also near the Visitor Center is a large campground and a horse stable. In Kentucky, the Blue Heron Interpretive Center in Stearns serves as the Visitor Center. The Blue Heron Outdoor Museum preserves an abandoned coal mining town. Not surprisingly, the original structures were removed or have decayed since the mines were shut down in 1962. In their place stand “ghost structures” built on the site of the old buildings. The museum tells the story of the miners, their families and the community. We did not visit this area, but we hope to in the future. 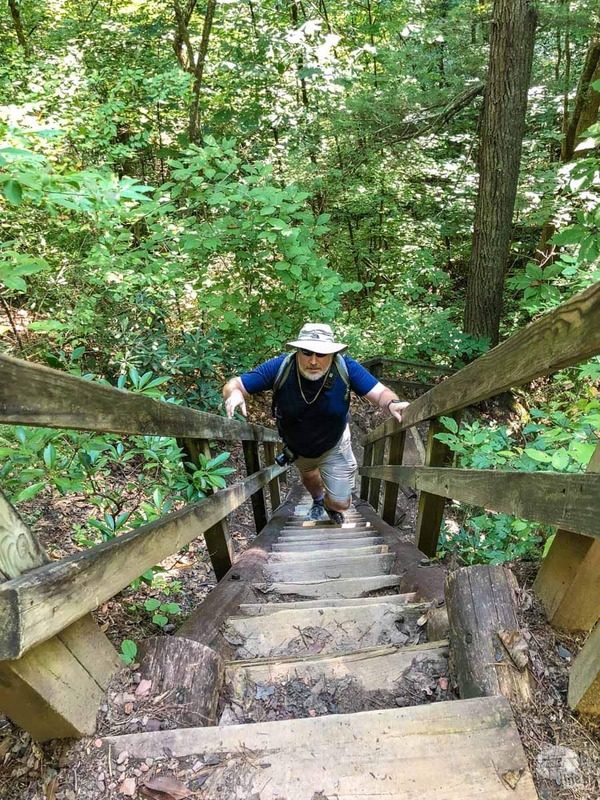 There are many hiking trails, both long and short, in and near Big South Fork NRRA. 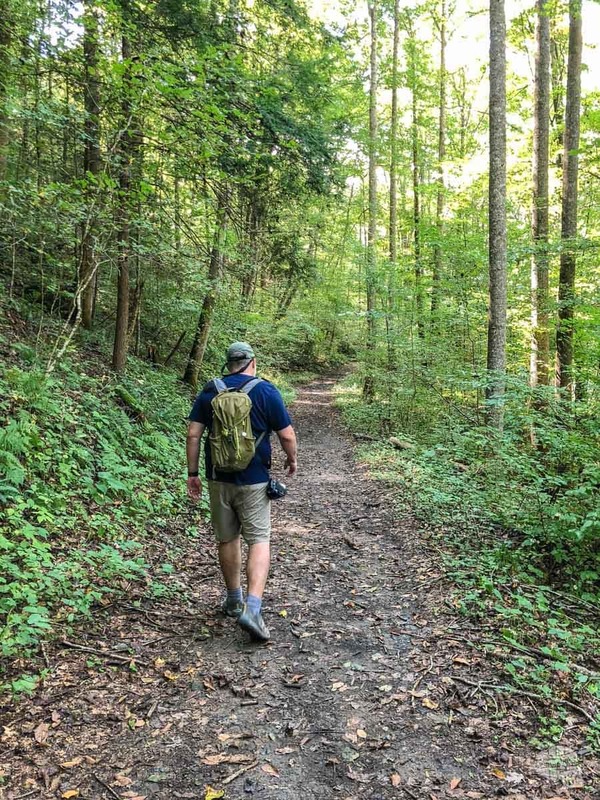 In fact, Big South Fork is home to three National Trails for those looking for some overnight backpacking trails. We started our hiking on the west side at Twin Arches. There are two options for hiking to Twin Arches, the easy/moderate 1.2-mile upper loop or a moderate 4.5-mile loop. 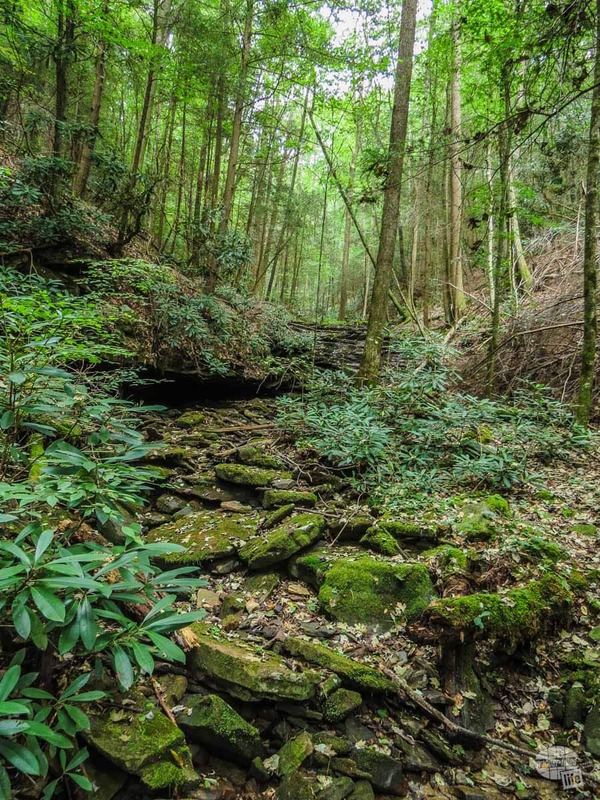 Both hikes will take you to one of the most unusual and beautiful geological features of Big South Fork. 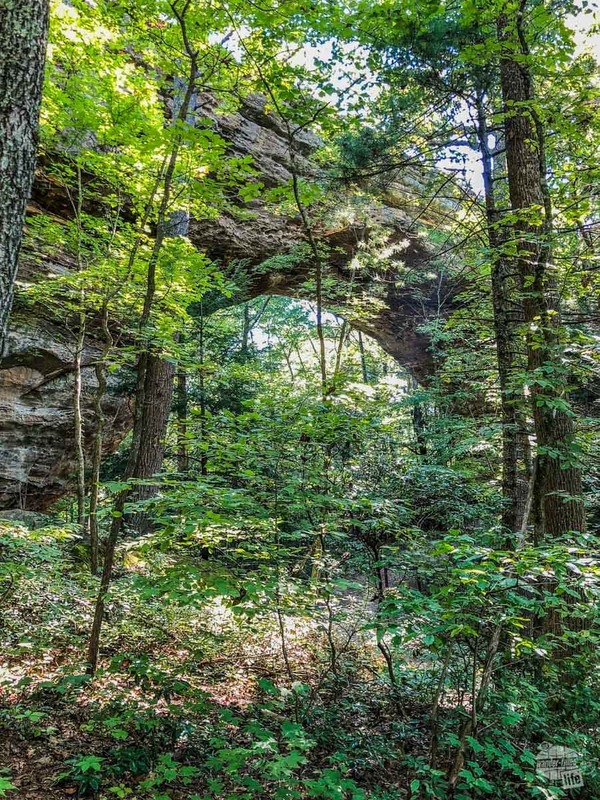 The Twin Arches are two sandstone arches, considered the largest natural bridge in Kentucky and Tennessee. Since we had a few other hikes we wanted to do, we chose the 1.2-mile upper loop. The hike was easy other than a few steep sections of stairs. You can easily reach the arches in just about 10-15 minutes, depending on which way you take the loop (going to the right will get you there faster). The arches themselves are huge! And they are just hiding here in the woods – you almost stumble upon them without any warning. Yes, these arches are every bit as impressive as the arches you find at Arches National Park in Utah. Grant climbing the steep stairs. The longer 4.5-mile loop passes several rock shelters, an old home site and the Charit Creek Lodge, which is accessed by foot, bike or horse only. Finding arches like this in the eastern US is rare, so this was definitely a nice surprise! Our second hike of the day was a 3.5-mile loop at Middle Creek. 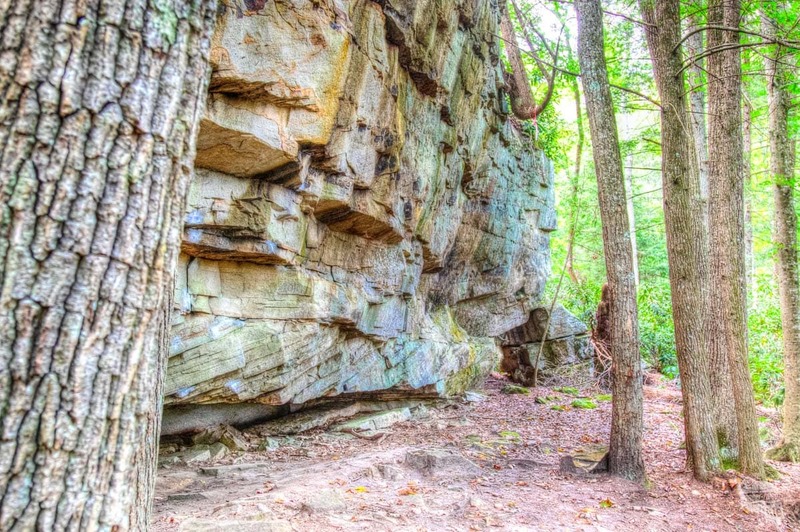 This trail winds through a hardwood forest and several rock overhangs, rock shelters and high cliffs. While rock shelters are not quite as unique as arches in this part of the country, the concentration of rock formations was quite staggering. Seriously, I lost count of how many rock shelters we passed, but I would guess at least 15. Rock shelter on the Middle Creek Loop trail. The hike itself was fairly easy. There were a few somewhat steep sections, but nothing that gave us pause or really slowed us down. Honestly, the toughest part of this trail was that it is not regularly traveled and, thus, we encountered a LOT of spider webs. Yes, spider webs are always a hazard when hiking. And we’ve encountered our fair share of them. But this trail had way more spider webs than I have ever encountered. Possibly more than all the other trails we’ve hiked combined. No, I’m not exaggerating. Just some funky fungus we found along the Middle Creek Loop trail. I really want to say that I enjoyed this hike. But, honestly, there were too many spider webs for me to really be able to say that. That didn’t make this a bad hike, it just made it a bit frustrating. 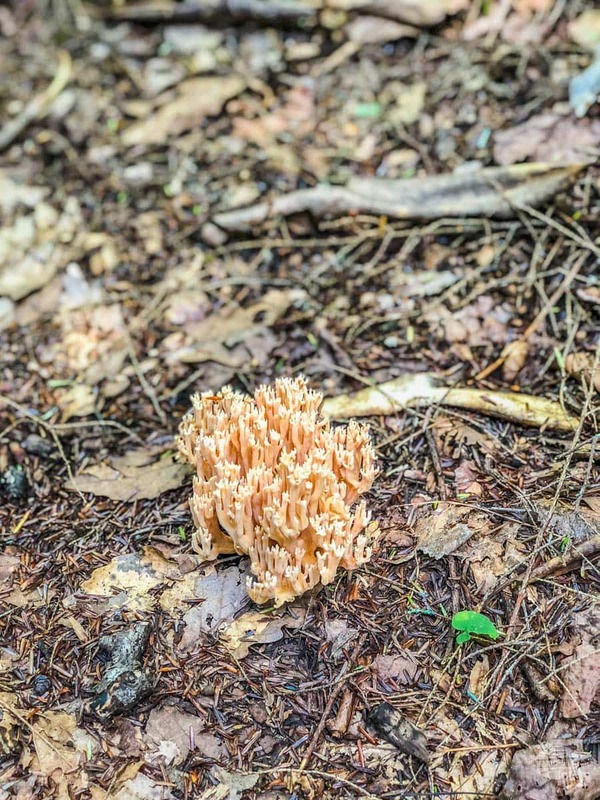 If you choose to do this hike, just be prepared. Beginning at the Leatherwood Ford trailhead parking lot, the Angel Falls Rapid Trail follows the Big South Fork River to one of the river’s most famous and feared rapids. Unfortunately, since we had already hiked about 5 miles, I was not up for the full 4-mile round trip on this trail. While we generally prefer loop trails so that we are not back-tracking on the trail, an out-and-back trail does allow you to just hike as far as you want before returning. That is exactly what we did here. We ended up hiking about a mile on this trail before turning around. For much of that first mile, the trail is up above the river, with very few places to easily get down to the water. Right at the one-mile mark, we found a large, relatively flat rock that was easy to get to. This provided the perfect resting point for us before we turned around. The story of this rapid is a rather interesting one. Originally, it was a 10-12 foot split current waterfall around a couple of large boulders. Before the park was established, a couple of fishermen decided to blast one of the boulders in an effort to improve boating and fishing. Instead, it created a dangerous class III-IV rapid with a bad undercut. Yes, I am disappointed that we did not make it all the way down the trail to see just how treacherous this rapid is. Hopefully, we’ll make it back one day. I’m sure Grant would love to raft this river, though paddlers are encouraged to portage around this particular rapid. Yep, that’s a rapid I at least want to see! If you are not up for a lot of hiking, I would suggest you stop at the East Rim Overlook. Here, a short 0.1-mile paved trail takes you to one of the best overlooks in the park. 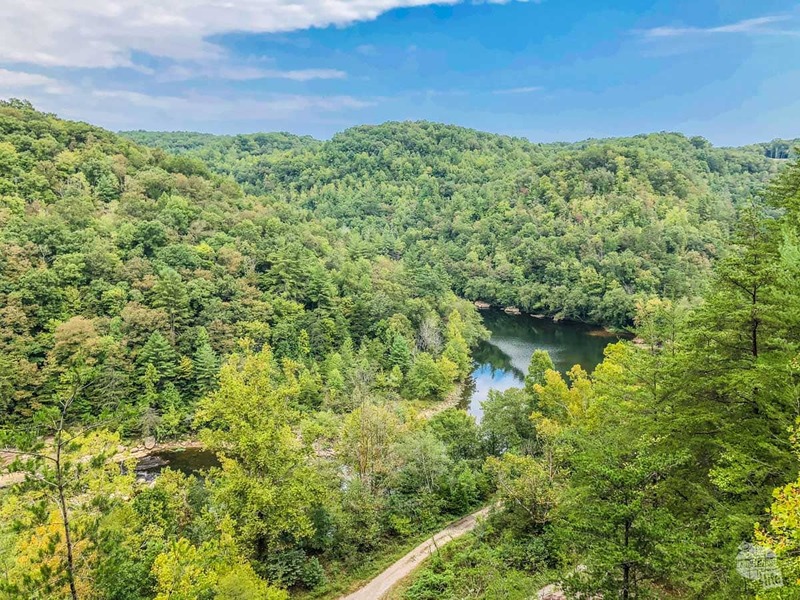 From the viewing platform, you can see the Big South Fork River below, along with the deep gorge it has created in the Cumberland Plateau. The hiking guide says that this is a great place to see fall colors. Unfortunately, we were there a few weeks too early for that show. 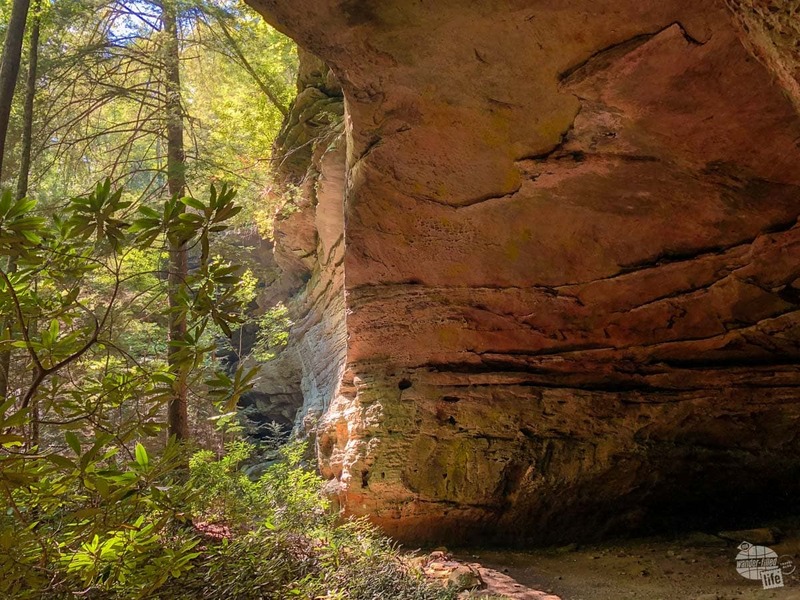 This is a must-see stop for anyone visiting Big South Fork NRRA. Big South Fork offers two large developed campgrounds, one in Tennessee and one in Kentucky. Additionally, there are two equestrian campgrounds (again, one in each state) and a primitive campground in Kentucky. The only lodging inside the park is found at the remote Charit Creek Lodge. There are no roads to the lodge – access is for hikers, bikers and horseback riders only. Once at the lodge, you’ll find cabins and dorms, meals, restrooms and showers. We did not visit the lodge but it sounds like something we would enjoy. 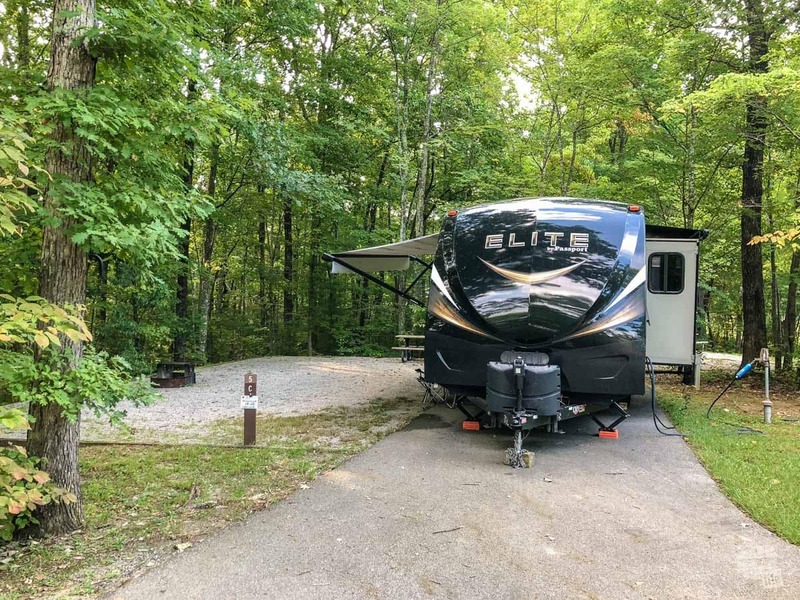 For those visiting the Tennessee portion of the park, the Bandy Creek Campground is your best option for RV or tent camping. For RVers, there are 96 sites with water and electric hook-ups. There is a sewer dump station at the front of the campground. Both tent and RV campers will find easy access to restrooms and showers. The campground also features a swimming pool, volleyball courage and a couple of playgrounds. 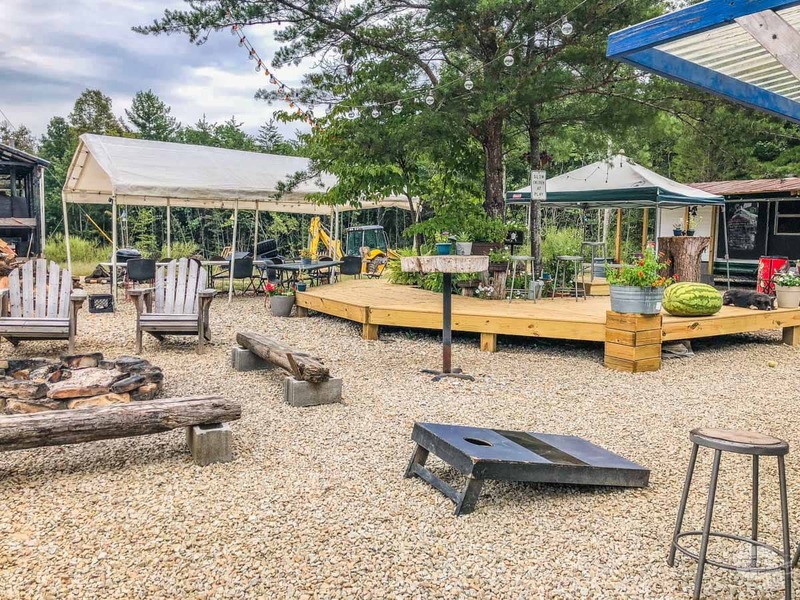 The sites here are large – RV sites have a paved parking area and a large gravel area for the picnic table and fire ring. In this space, you can also set up a couple of tents and several chairs. Most sites are at least semi-private, with plenty of trees behind and between the individual campsites. We spent three nights here and loved every minute of it. Seriously, other than the lack of sewer hook-up, this campground was just about perfect. This was certainly one of the best national park campgrounds we’ve ever stayed at. 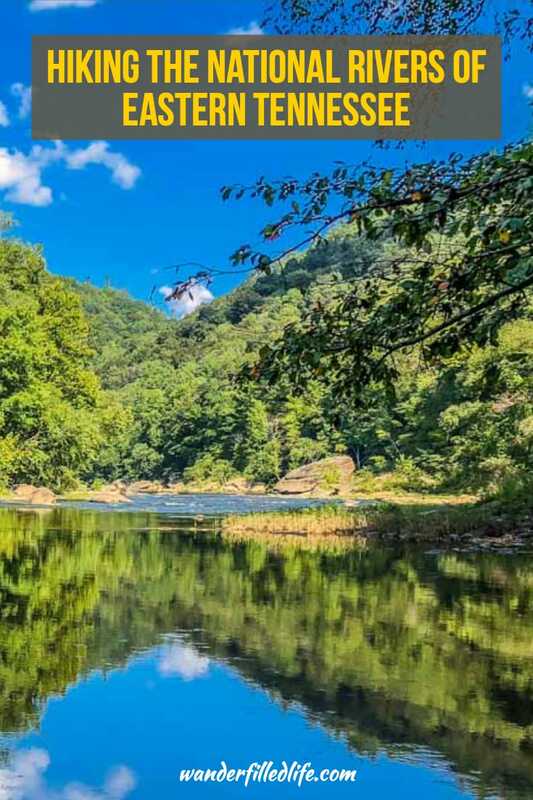 Located about an hour south of Big South Fork NRRA, Obed WSR has a similar vibe with many of the same recreational opportunities. Boating, hiking, rock climbing and boulder climbing are all popular activities here. The Obed Visitor Center is located in Wartburg, TN. While the visitor center is fairly small, you can watch a film and see a few exhibits. Also be sure to pick up a park map, newsletter and hiking brochures. The confluence of the Obed and Emory rivers. A designation as a Wild & Scenic River ensures the river will remain free-flowing and without unnecessary development. Thus, this is a very remote area with few services. This also means that the whitewater conditions can be quite dangerous at times. In fact, the warnings on the official website were almost scary. The limited development also means that access to the river is limited. The two main access areas are Nemo, which also offers camping and Lilly Bluff. As usual, we struck out to explore Obed WSR on foot through its trails. While there are quite a few trails here, most of them are fairly short. There is one 14-mile difficult trail for those really looking for a challenge, though. For our first hike, we chose the Emory River Gorge Section of the Cumberland Trail. This hike starts at the Nemo picnic area and follows the Emory River to its confluence with the Obed River. This out-and-back trail is about 2.5 miles round trip. 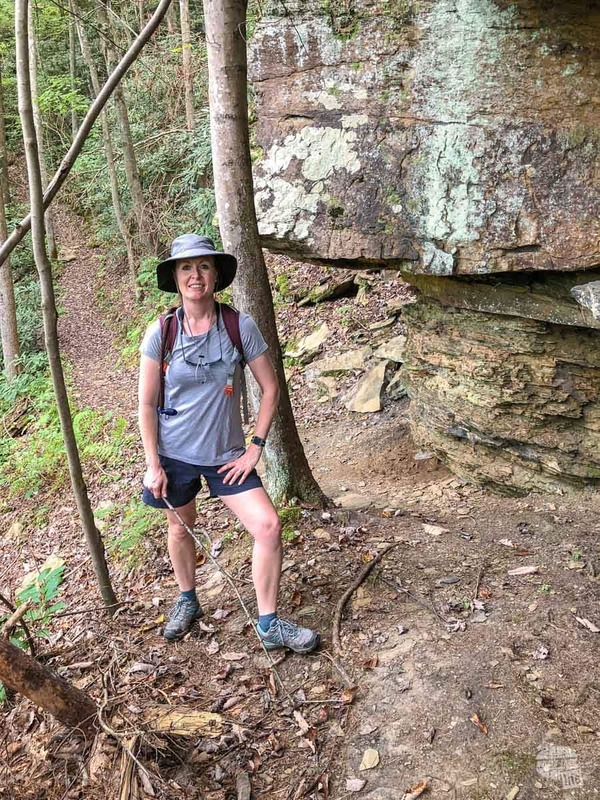 Bonnie hiking on the Cumberland Trail – Emory River Gorge Section. Early in the hike, you’ll ascend about 300 feet through a couple of series of switchbacks. After this initial climb, you’ll have very little elevation change. As you hike, you’ll get a few glimpses of the river, but you’ll definitely be able to hear more than you can see. Nearly all of the trail is through a hardwood forest. 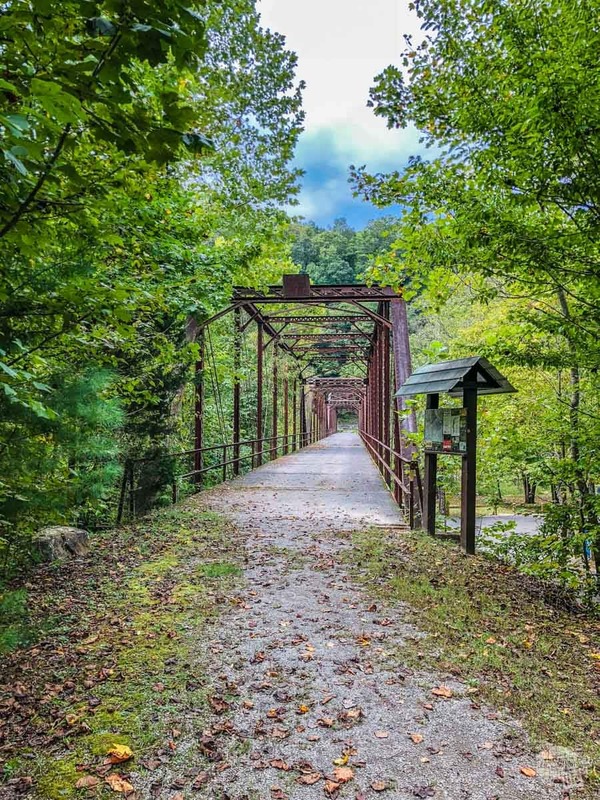 Right at the confluence of the two rivers, the trail opens up to a large, open overlook with sweeping views of both the Obed and Emory Rivers. This is a great place to take a few pictures, rest and enjoy the scenery. The historic Nemo Bridge over the Emory River. The trail does continue another quarter-mile or so to a seasonal cascade. Sadly, there was no water at all when we were there. From what we saw, though, I am sure that it would be worth the extra 5-10 minutes in the spring and summer. After the hike, we enjoyed a picnic lunch and a walk across the old bridge. Located about 30 minutes north of Nemo, the Lilly Bluff area offers sweeping views of the river and gorge and a few short hiking trails. From the parking lot, the Lilly Bluff Overlook is reached by an easy 0.3-mile trail. Strollers and wheelchairs should be able to navigate this trail with ease. 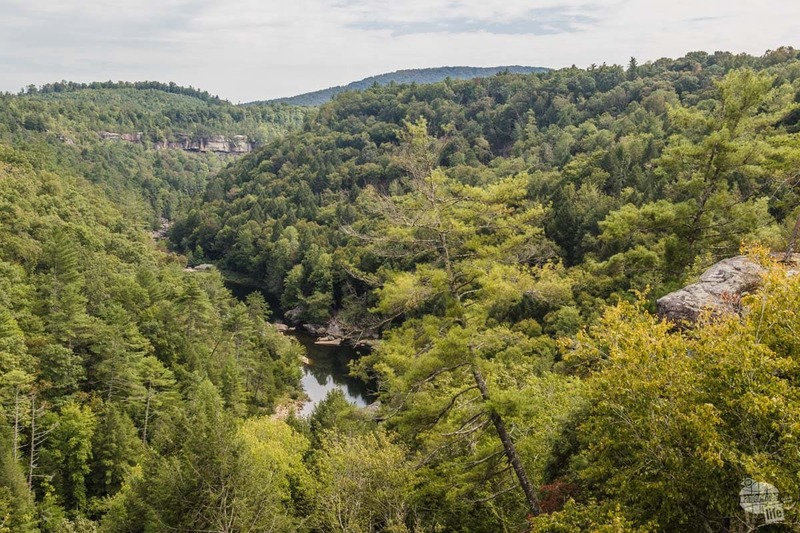 The Obed River from the overlook at Lily Bluff. A large boardwalk at the overlook offers multiple views of the river and gorge below. The view is slightly different from each of the various areas, so be sure to walk around all of them. This is certainly the best view that we found of the river. From the Lilly Bluff Overlook parking lot, you can follow another short trail down and across the road to a large boulder field. Here, the trail meanders among quite a few massive sandstone boulders. Supposedly, rock climbers use these for training, but we didn’t see any the day we were there. The boulders area is frequented by rock climbers. The boulder field was donated to The Nature Conservancy by a private owner. 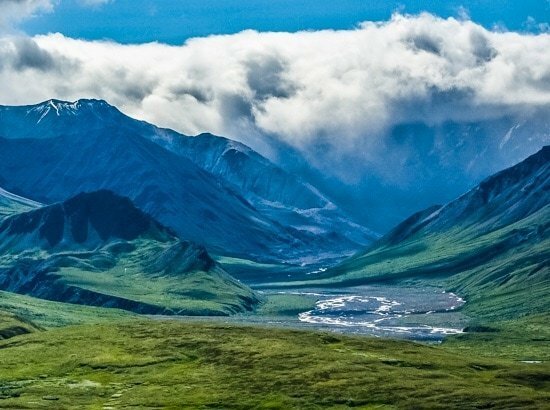 Today, the park service and The Nature Conservancy work together to protect this area. Altogether, we hiked about 1.1 miles in this area between the parking lot, overlook and boulder field. This area of Tennessee is fairly remote, so plan ahead in terms of food and drink. In Oneida, just east of Big South Fork, you will find a Wal-Mart and several restaurants. Since the drive east out of the park is not an easy one, we stocked up on groceries and enjoyed all of our subsequent meals at the campground. The dinner plates from Zak Designs really complete a meal. Additionally, it is worth noting that Oneida is a “moist” county, meaning you can only purchase beer and wine. We did eat lunch at a Mexican restaurant, El Rey Azteca, when we first got to town. The food was good but it was weird to not even have the option to order a margarita. We only spent a few hours at Obed WSR and took a picnic lunch with us. But, we did stumble upon Lilly Pad Hopyard Brewery just east of the Lilly Bluff bridge. Grant actually had heard about this brewery from the folks at Reformation, our hometown brewery, so we couldn’t pass up the opportunity to stop and enjoy a few drinks. Lily Pad Hopyard Brewery offers a great outdoor space to enjoy a cold beer. Lilly Pad offers eight brews and a fabulous outdoor area in which to enjoy them. There is also a food truck, The Sauced Frog, on site. Lilly Pad uses many of their own home-grown hops, honey and herbs. We both found the beer to be tasty and easy to drink. Yep, it’s probably about time that I stop saying I don’t drink beer. 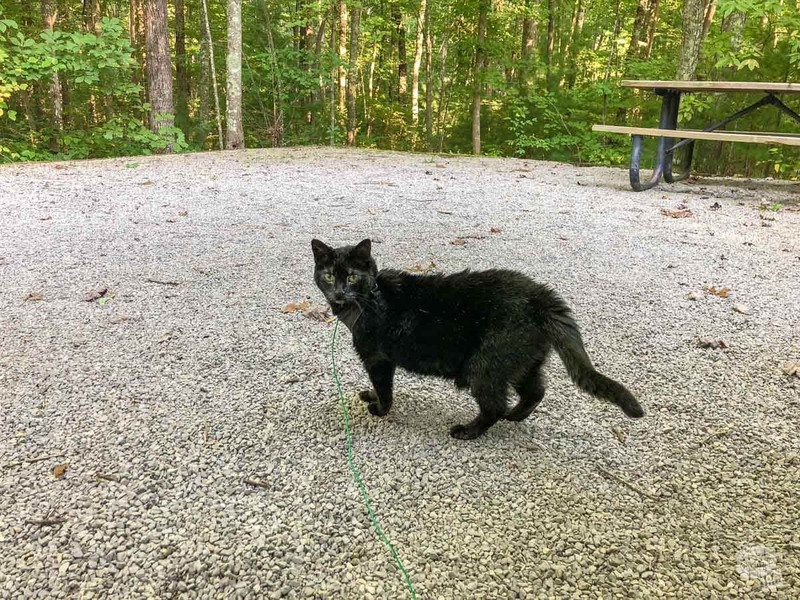 After visiting several National Recreation Areas, National Rivers and other water-centered parks, we weren’t really sure what to expect at Obed and Big South Fork. Honestly, these types of sites are often hit-or-miss in terms of things to do other than boating. Even some that appear to have other activities online sometimes end up being a bit of a disappointment. 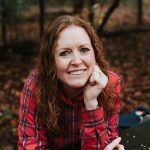 I have to say, we were pleasantly surprised by both of these parks and Big South Fork in particular. We truly enjoyed our time at both and could easily see a return visit to Big South Fork NRRA in our future. During wet times, there is a cascade down these rocks on the Emory River Gorge Trail at Obed WSR. Specifically, we’d like to check out the Kentucky portion of the park. We also would likely enjoy a visit to the hike-in lodge and perhaps more hiking along the river itself. And Grant is always jonesing to do some whitewater rafting! Big South Fork NRRA definitely turned out to be a hidden gem of the National Park System and one that we would encourage anyone to visit. Our visit in mid-late September was just about perfect, other than still being a bit warm. A Fall visit in mid-October would likely provide some fabulous fall colors and cooler temperatures. A spring or summer visit might provide more opportunities for whitewater rafting. 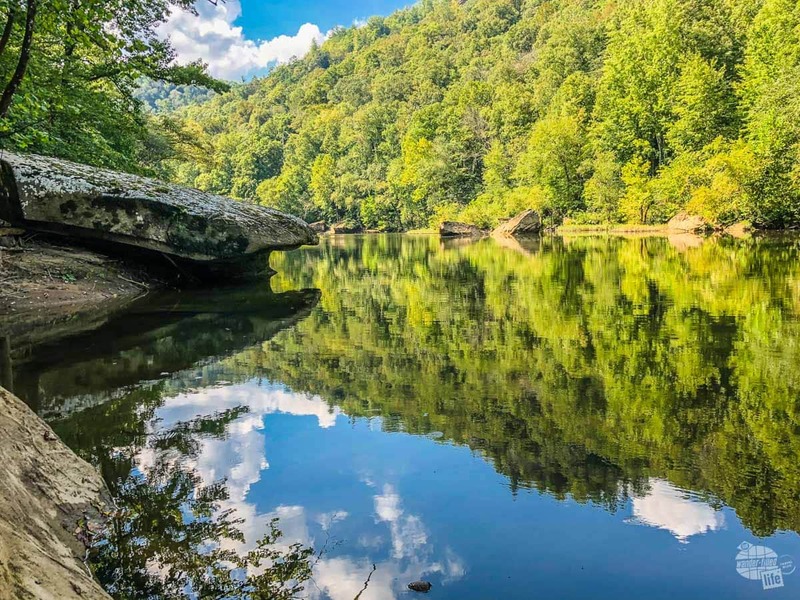 If you are looking for a remote place to just enjoy the outdoors, both the Obed Wild and Scenic River and Big South Fork National River and Recreation Area are great options!